We really don’t know what the story is with this one. 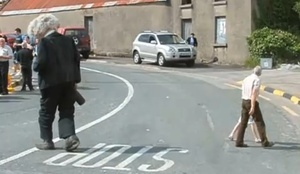 YouTube tells us the puppet’s name is Arthur and he’s wandering around Dromore West in Sligo, presumably sometime last summer. If you have the internets in Dromore West, any information about Arthur would be gratefully received. Posted in Misc and tagged drunk, puppet, sligo at 9:00 am on January 19, 2011 by Susie Phillips.